Disturbed Body Image: Confusion in mental picture of one’s physical self. Body image is how a person feels about his or her body and what they do about those feelings. Some may feel inferior about their bodies and try to improve them through a variety of means called appearance management behaviors. As a significant component of one’s self-concept, body image disturbance can have an intense impression on how individuals see their overall selves. A person begins forming his or her perceptions of body’s attractiveness, health, acceptability and functionality in early childhood. This body image continues throughout the lifespan and receives feedback from peers, family member, and coaches. For example, a woman may experience Disturbed Body Image during pregnancy. Physical changes associated with aging may result in body image disturbance for the older adult. Personality traits such as perfectionism and self-criticism can also affect the development of a negative internalized image of the body. Appropriate care for distorted body image is a significant step to recovery. Cognitive Behavioral Therapy, an approach where irrational thoughts are recognized, analyzed and restructured to more rational self-talk, is frequently used in planning care to address body image disturbance. Verbalization about altered structure or function of a body part. Patient incorporatess changes into self-concept without negating self-esteem. Patient verbalizes acceptance of self in situation. Patient discusses with family/SO about situation, changes that have occurred. Patient develops realistic goals/plans for the future. 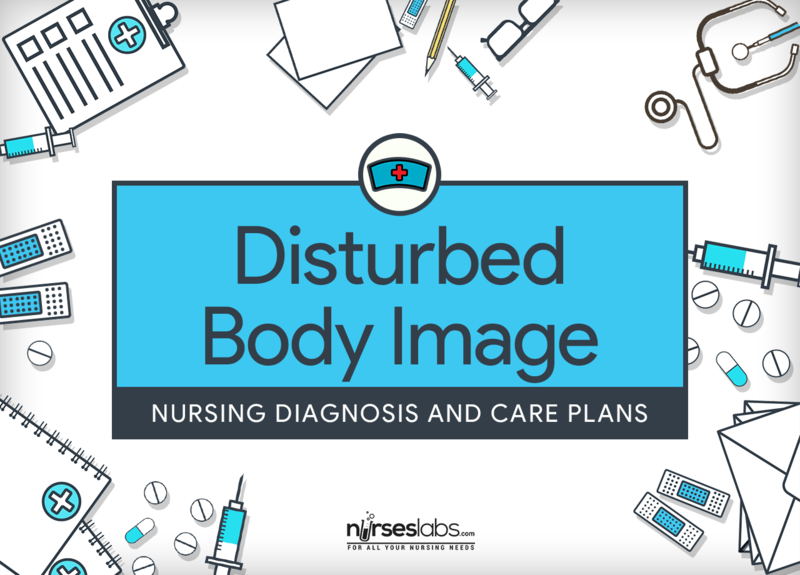 The nurse’s assessment of the perceived alteration and importance placed by the patient on the altered structure or function will be very important in planning care to address body image disturbance. Assess meaning of loss or change to patient and SO, including future expectations and impact of cultural or religious beliefs. The extent of response is more related to the value or importance the patient places in the part or function than the actual value or importance. This necessitates support to work through to optimal resolution. Assess the perceived impact of change in ADLs, social participation, personal relationships, and occupational activities. Alteration in body image can have an effect on the patient’s ability to carry out daily roles and responsibilities. Assess the result of body image disturbance in relation to the patient’s developmental stage. Adolescents and young adults may be individually affected by changes in the structure or function of their bodies at a time when developmental changes are normally rapid and at a time when developing social and intimate relationships is particularly important. Evaluate the patient’s behavior regarding the actual or perceived changed body part or function. There is a broad range of behaviors associated with body image disturbance, ranging from totally ignoring the altered structure or function to preoccupation with it. Evaluate the patient’s verbal remarks about the actual or perceived change in body part or function. Negative statements about the affected body part may indicate limited ability to integrate the change into the patient’s self-concept. Acknowledge and accept expression of feelings of frustration, dependency, anger, grief, and hostility. Note withdrawn behavior and use of denial. Acceptance of these feelings as a normal response to what has occurred facilitates resolution. It is not helpful or possible to push patient before ready to deal with situation. Denial may be prolonged and be an adaptive mechanism because patient is not ready to cope with personal problems. Recognize the normalcy of response to the actual or perceived change in body structure or function. Experiencing stages of grief over loss of a body part or function is normal and typically involves a period of denial, the length of which varies among individuals. Set limits on maladaptive behavior. Maintain nonjudgmental attitude while giving care, and help patient identify positive behaviors that will aid in recovery. Patient and SO tend to deal with this crisis in the same way in which they have dealt with problems in the past. Staff may find it difficult and frustrating to handle behavior that is disrupting and not helpful to recuperation but should realize that the behavior is usually directed toward the situation and not the caregiver. Support verbalization of positive or negative feelings about the actual or perceived loss. It is worthwhile to encourage the patient to separate feelings about changes in body structure or function from feelings about self-worth. Expression of feelings can enhance the patient’s coping strategies. Assist the patient in incorporating actual changes into ADLs, social life, interpersonal relationships, and occupational activities. The more noticeable the change in body structure or function, the more anxious the patient may have about the response of others to the change. Opportunities for positive feedback and success in social situations may hasten adaptation. Exhibit positive caring in routine activities. Positive remarks by the nurse may encourage the patient develop more positive responses to the changes in his or her body. Be realistic and positive during treatments, in health teaching, and in setting goals within limitations. This enhances trust and rapport between patient and nurse. Provide hope within parameters of individual situation; do not give false reassurance. This promotes positive attitude and provides opportunity to set goals and plan for future based on reality. Give positive reinforcement of progress and encourage endeavors toward attainment of rehabilitation goals. Words of encouragement can support development of positive coping behaviors. Encourage family interaction with each other and with rehabilitation team. A good conversation provides ongoing support for patient and family. Provide support group for SO. Give information about how SO can be helpful to patient. Support groups promotes ventilation of feelings and allows for more helpful responses to patient. Provide thorough teaching and complete aftercare instructions for the patient. Reinforcing teaching can help patient achieve self-care. Discuss with patient about the normalcy of body image disturbance and the grief process. The patient experiencing a body image change needs new information to support cognitive appraisal of the change. Teach the patient adaptive behavior (e.g., use of adaptive equipment, wigs, cosmetics, clothing that conceals the altered body part or enhances remaining part or function, use of deodorants). Adaptive behaviors help the patient compensate for the actual changed body structure and function. Support the patient in identifying ways of coping that have been beneficial in the past. These may help the patient adjust to the current issue. Refer the patient and caregivers to support groups composed of individuals with similar alterations. Lay people in similar situations offer a different type of support, which is perceived as helpful (e.g., United Ostomy Association, Y Me?, I Can Cope, Mended hearts). Refer to physical and occupational therapy, vocational counselor, psychiatric counseling, clinical specialist psychiatric nurse, social services, and psychologist, as needed. These are helpful in identifying ways/devices to regain and maintain independence. Patient may need further assistance to resolve persistent emotional problems. Nursing Diagnosis: The Complete List – archive of different nursing diagnoses with their definition, related factors, goals and nursing interventions with rationale. The Ultimate Guide to Nursing Diagnosis – learn how to formulate nursing diagnoses correctly in this easy-to-follow guide! 1,000+ Nursing Care Plans List – the ultimate database of nursing care plans for different diseases and conditions! Get the complete list! What is a Nursing Care Plan? 9 Steps on How to Write a Care Plan – learn how to write an excellent care plan. We explain the concepts and walk you through the steps. Gil Wayne graduated in 2008 with a bachelor of science in nursing and during the same year, earned his license to practice as a registered nurse. His drive for educating people stemmed from working as a community health nurse where he conducted first aid training and health seminars and workshops to teachers, community members, and local groups. Wanting to reach a bigger audience in teaching, he is now a writer and contributor for Nurseslabs since 2012 while working part-time as a nurse instructor. His goal is to expand his horizon in nursing-related topics, as he wants to guide the next generation of nurses to achieve their goals and empower the nursing profession.